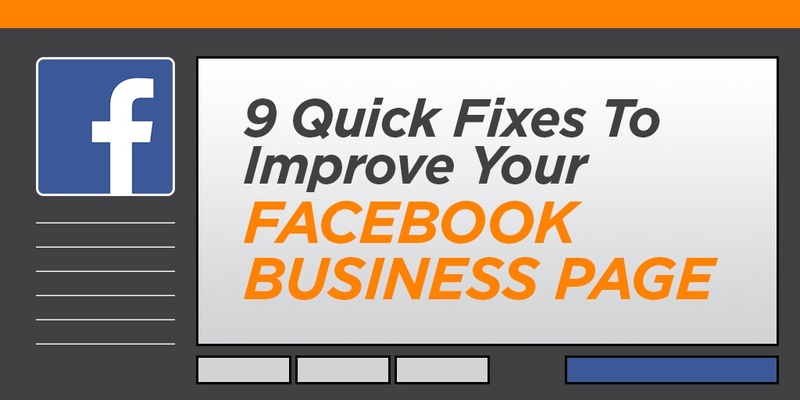 Your Facebook Business Page is like a second outpost for your business online. Nearly all of your customers will visit your website at some point before they buy from you. More and more are visiting your company Facebook page as well to learn more about your business. Make sure you’re creating the best impression possible with a strong Business Page. Even if you’re the face of your business, don’t try to substitute a personal Facebook profile for a real Business Page. First of all, you probably don’t want to mix your business communications with the pictures from your family vacation. Furthermore, personal profiles lack Facebook’s arsenal of business tools like page management, scheduling, advertising opportunities, and analytics. Business Pages are also public by nature, so your customers don’t have to “friend” you before they can interact with you. Keep in mind that you do need to have a personal profile associated with your Business Page as an admin. In other words, Facebook needs to know that there is a real person managing your business account. However, your customers will not be able to tell that you are an admin or see any of your personal information. If you need help getting started, here's a simple guide on how to create a Facebook Business Page. Your profile picture displays on the top left of your Business Page as well as on all of your posts and comments. Essentially, it’s everywhere. So you want to make sure that it’s something your audience will recognize. In most cases, you’ll probably want to use your business’s logo, mascot or something similar. Currently, profile pictures display at 170x170 pixels on desktop and 128x128 pixels on mobile. That’s not big to start with, but it gets even smaller on posts and comments. A square image works best, but remember, Facebook will crop it to a circle on posts and comments. If your logo is long horizontally (like ours is), you may want to adapt it, so it’s legible on Facebook. Note: Facebook changes photo dimensions all the time. Double-check their help section for the latest info. A custom URL, or vanity URL, enhances the branding and professionalism of your business page. Plus, it’s a lot easier to share. To change the URL for your business, you must create a username for your Page. On your Business Page, go to About and look for Username to set or change your page’s username. Try to keep it as close as possible to your business’s name without duplicating a username someone else is already using. Dominating the top of your Facebook page, your cover image is one of your simplest tools to make your Business Page stand out. Choose high-quality imagery that makes an impact with your audience. Generally something with white space that’s not too busy works best. Use text judiciously to add emphasis and drive engagement, without filling your cover with words. You can even use your cover photo to emphasize the buttons directly below, encouraging users to follow your page or contact you. This cover photo from Good Goat Milk Co. has a nice mix of imagery and text that highlights the benefits of the product and naturally encourages people to click on the Shop Now call to action. Facebook automatically crops your larger desktop cover photo when viewed on mobile devices. The problem is that they chop off a good portion of the left and right sides. So your cover photo may look great on your computer, but if you have a key element or text too close to the edges, it may get cut off on mobile. Design your image to be taller than the recommended 820x312 size. (One source recommends 820x461 pixels). You can position your desktop cover photo to center the image. Then it will display without cutting anything off on mobile. As we mentioned before, one of the great things you can do with your cover photo is draw attention to the buttons immediately below. One of those buttons is a custom call to action so you can tell your Facebook visitors what you want them to do next. That can be visiting your website, sending you a chat message, booking an appointment, making a purchase or donation, and much more. To add a button, log in to your Business Page and look for +Add a Button below your cover Photo. Select which button type you want and follow the instructions to add it to your page. Like your website, many people visit your Facebook page looking for information about your business. Create the best impression possible by completing the About section of your Business profile. Depending on what category of Business Page you created, different features will be available. In general, make sure you describe what your business is all about and include contact information so people can reach you easily. If you have a physical location, include a map and business hours too. Your Facebook Business Page is a highly customizable tool that can be extremely powerful. 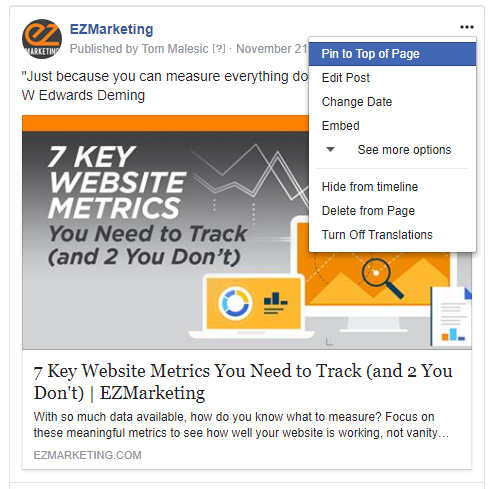 All Business Pages start with standard tabs like About, Photos and Posts, but you can add custom tabs to create an even more engaging experience. 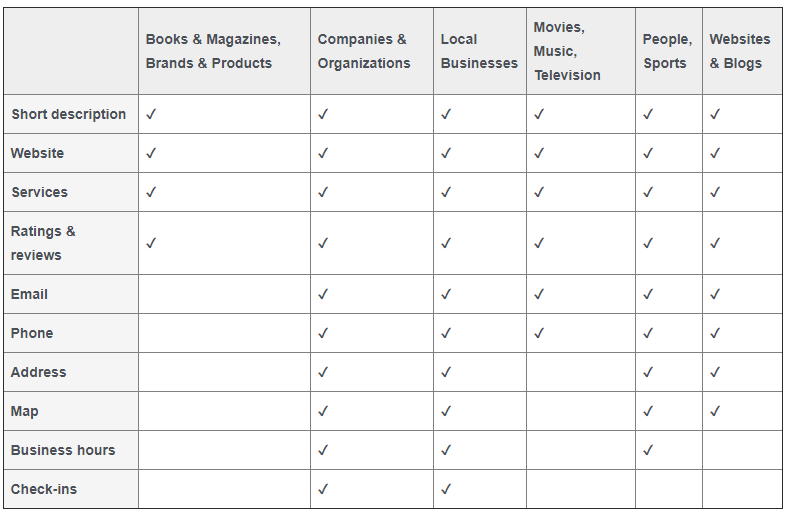 You can run contests or polls, provide special offers, capture leads, and much more. Facebook also integrates with a ton of 3rd party apps, which provide even more options – like all these useful Facebook Page apps. You can also re-arrange tabs to highlight your most important content first. All your tabs will display on the left-hand sidebar of your page, but the tab order determines the order of sections in your Page’s timeline. Do you want your posts to show first, or do you want to highlight your reviews, or maybe your videos? It’s completely up to you. 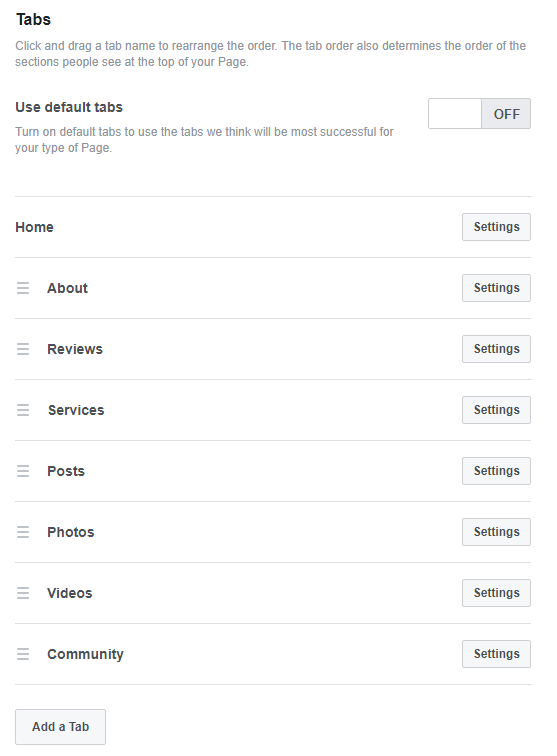 To manage your tabs, click Settings in the upper-right of your page manager. Then click Edit Page. You’ll see a list of all the tabs on your page. From here, you can rearrange the existing tabs or add new ones. Another way to draw attention to important information is to pin your key posts to the top of your page. That way you can keep critical announcements, current offers, and special events highlighted at the top of your timeline. Just make sure to keep your pinned content current and swap it out regularly. Messaging and live chat are becoming an increasingly popular way for your customers to reach your business. Over 60 million businesses use Facebook Messenger, sending more than 2 billion messages back and forth with users each month. Despite this, many businesses fail to respond to customer inquiries on their Facebook pages – or at least, they don’t respond quickly enough. Think of Facebook Messenger as an alternative to phone-based customer support. When someone calls into your business, first and foremost, they expect someone to answer. Second, they expect to be able to get help and speak to someone quickly. They don’t want to get stuck on hold forever. Treat messaging the same way. Monitor your Facebook pages and respond to messages consistently and promptly. If you reply to 90% of messages within 15 minutes, you can even earn a “Very responsive” badge for your Page. This lets your visitors know that they can expect great service from your page and makes them more likely to message you. To help with this, Facebook provides automated response assistance, which can provide greeting messages, instant replies and reminders. Within your Page Manager, go to Settings à Messaging to change these options. You can also download the Pages Manager App on your phone to get mobile notifications when new messages come in. Even if you already have a great Facebook Business Page, it’s always worth a second look. Facebook is constantly changing and adding features, so it’s important to review your Facebook Page regularly. Have any other tips to share? Leave us a comment on our Facebook page! 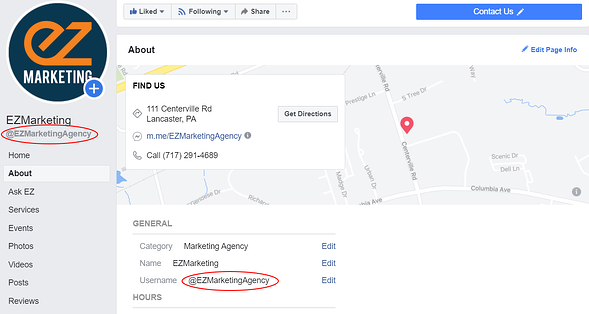 If you find you just don't have the time to manage your Facebook business page, keep in mind we offer Facebook marketing services to help simplify your life.